At the Yelloh! Village Les Ramières, children take centre stage! They'll be really happy to get together with their new friends in the campsite's kids' club. Children aged 5 to 12 are supervised by multilingual organisers 6 days a week during high season and at weekends, during holidays and public holidays in low season. They'll have a huge range of activities to choose from, including outdoor games, treasure hunts, handicraft and sports activities and sports tournaments! In the evenings, they won't want to miss the junior disco! Watching them dancing and having a great time is a lovely thing to enjoy! Your children really will be happy - and so will you! In high season, your children will enjoy discovering the activities on offer at the Yelloh! Village Les Ramières! In July and August, a dedicated team is there to entertain your children! They can enjoy a wide range of events with something for everyone. 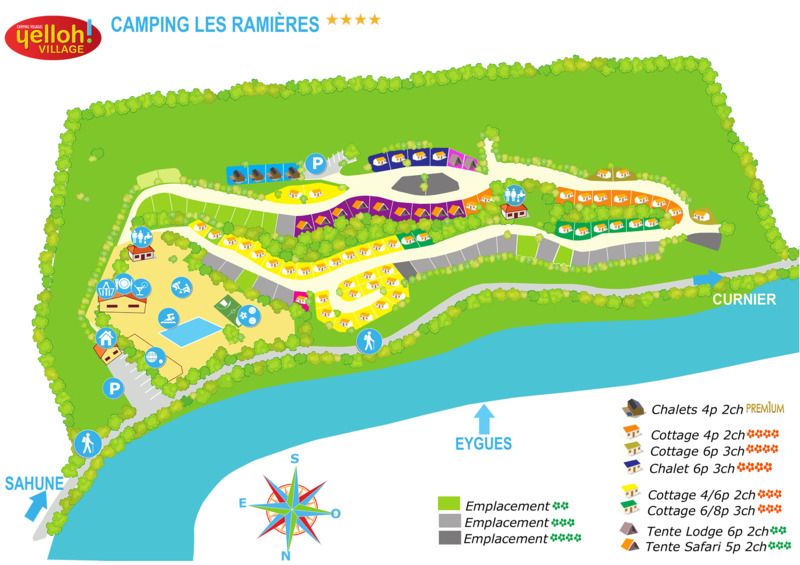 Your children will be thrilled to set off for a camping holiday in Drôme Provençale, staying at the camping Les Ramières. Here, they'll find a games area with swings, slides, as well as a treeclimbing adventure trail for the little ones, a bouncy castle, a football and volleyball pitch, so it's perfect for letting off steam! They'll be able to cool off in the aquatic area, with its heated pool and paddling pool, and some great times await them. It will also be really pleasant to spend a day with the family in the campsite at the Eygues river, which runs alongside the campsite.